Convenient 8 oz. refillable spray bottle. 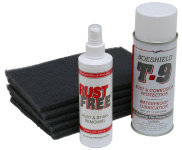 Rust Free is non-toxic and biodegradable. 8.0 Fl. Oz. Spray Bottle. Save when you purchase case quantities. Buy 1 case (12 bottles) and save $1 per bottle. If you need larger quantities, Rust Free is also available in a one gallon container.